Coming out of lurk mode to comment. What a great tradition you two have! It’s nice to have a knitting buddy! Beautiful vests. Both color combinations are very compelling. Gorgeous vests! You’re right, they do look so very different. Now that’s some seriously fabulous knitting and friendship! Hi! I have been lurking for just over a year and yours was the first blog I ever read when looking for a free beret knitting pattern. I had been returning to knitting having not done any since teenhood and needing something to keep me occupied during frequent visits to doctors and hospitals after my two year old boy was diagnosed with Type 1 Diabetes. Knitting has heled me feel a little more grounded and creative when so much else has been out of my control. The diagnosis broke my heart. I was the wholefood mama who let no baddies pass my boys lips. Your blog was a taste of another country and an escape. I thank you for that. Finding out Mr.G’s father has T1D was a wierd coincidence. I wish you a 2010 where you find peace with what is and are able to embrace it. I have tried fighting reality and it doesn’t work. It’s still there when you open your eyes again. Many good wishes from England to you and your family. These vests are fabulous and so is your knitting buddy exchange. Thanks for posting the photo. Your vests are gorgeous. I love the effect of the extra length. It really suits you. I really love the idea of a knitting exchange. It’s the thing I miss most about sockapalooza – despite all of its craziness, it was about the spirit of exchange and creativity that for some of us is harder to find among our friends and families. 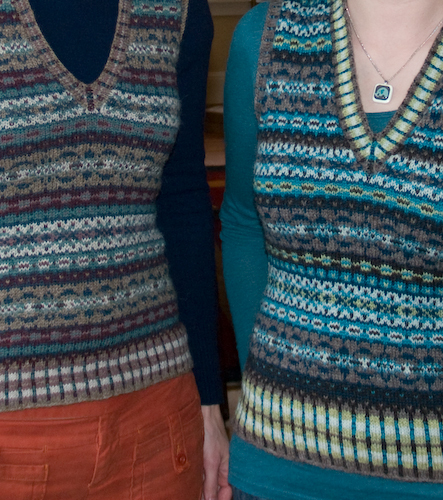 Your vests are both so beautiful — how much fun to have each other to knit with and for! I’m coming to your previous post late, but wanted to offer my sympathies on your 2009, and hope that your 2010 will be much brighter. It seems so many of us couldn’t be rid of last year fast enough, with its endless frustrations and difficulties and sometimes downright gloom. Hopefully we have all seen the bottom, and are now heading up towards the light. They are both beautiful vests! This is such a fantastic idea. You must know each other well to be able to choose what one another will like. Congrats on another gorgeous knitting project! How interesting to see the two vests together! They’re both beautiful, and what fun to exchange them. As for 2009 – wishing you a better, less “complicated” year in 2010. Those are FLIPPIN’ gorgeous. I wish I knew how to make something like that. I need someone to teach me!! My little group only exchanged scarves! I’m so glad to see your Christmas exchange turned out so well! 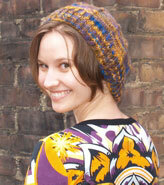 Part of the intrigue of Fair Isle, for me, is seeing how simply changing out a few colors can transform a design! Beautiful knitting! I love them both.